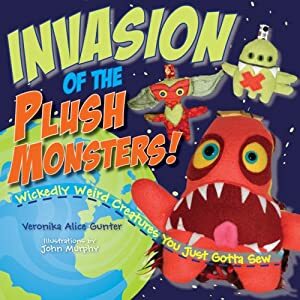 Recently, I checked out a copy of Invasion of the Plush Monsters! by Veronika Alice Gunter. It’s somewhat funny and worth checking out. She introduces each creature as though it were part of some B movie trailer or War of the Worlds news coverage of space aliens. I have a lot of old clothes I want to use up, so I’ve been thinking a lot lately about trying to make some manner of plush creatures and/or sock monsters. As I posted on almost all of my social networking statuses (we should change the pluralization to “statii” – it sounds cooler), the wrong side of sweatshirt material provides a cheap alternative to buying fleece or fur for these little creatures. These are small projects that use up old material and don’t require a lot of time. Plus, they’re just really awesome and I’m dying to make some. My problem is, as magnificent as Gunter’s creations are, there is something in me that prevents me from making them. It’s as though I feel I should be creating my own little creatures, which, is all well and good, but that my mind starts churning and spewing out this great deluge of large, detailed creatures that are more like works of art in their own right than just funny little creatures. I don’t have time for that, nor is it what I’m shooting for. But, as with almost everything, my imagination doesn’t want to lay complacent to something so simple. “But look!”, my mind tells me, “You’ve already seen what these creatures look like.. we need to do something bigger and better!” After which, all productivity comes to a standstill as I procrastinate and wait for my mind to make itself up as to what I really want to do.